Computer scientist and blogger Randy Olson is known for using his data tinkering skills to answer big questions like, "What’s the quickest way to find Waldo?" 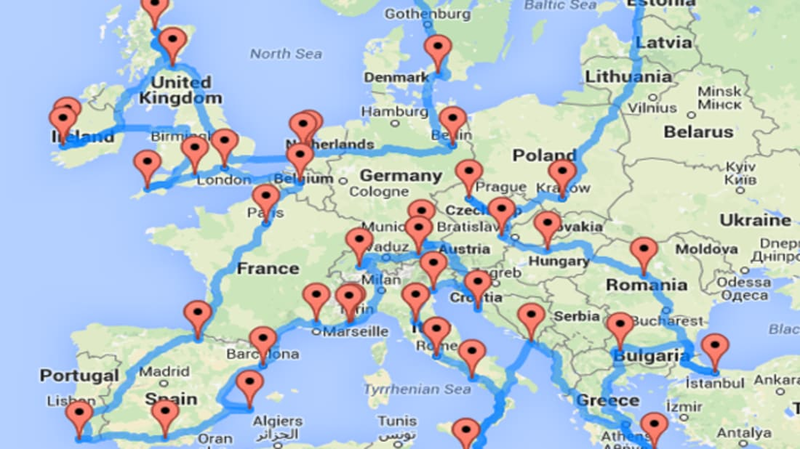 And, "How many European landmarks could I visit if I drove for two weeks straight?" The answer to that last one is 45, at least according to the optimized road trip map Olson published in March. Using special algorithms and Google Maps, he was able to calculate a route that would that would take him through each stop with as little backtracking as possible. The route added up to 16,287 miles (26,211 km) and a total driving time of 14 days. When deciding which destinations to include on the trip, Olson looked to Business Insider’s list of “50 Places in Europe You Need to Visit in Your Lifetime.” It hits most of the major monuments (Stonehenge, the Sistine Chapel) as well as some under-the-radar spots (an amusement park in Copenhagen, an “Ice Bar” in Sweden). Only 45 of the 50 listed made the cut, because a handful of them were impossible to access by car. Lucky for us, he has some handy data shortcuts up his sleeve. Genetic algorithms made it simpler to come up with great (if not the absolute best) routes. It’s the same trick he used when visualizing his Where’s Waldo? data and when calculating a previous map he made for the ultimate road trip across the U.S. Though his European trip totals a mere two weeks, that’s not including breaks for sleeping, eating, or stepping out of the car to enjoy the places you’re visiting. He recommends setting at least 3 months aside to fully take in the sights. Now if only someone could make a companion map of 45 hostels to stay at.